When I was younger, I thought sandwiches were boring. Bread with just stuff in the middle was how I looked at it. Thankfully, with age, I wised up. Sandwiches can be fantastic! And I’m paying them more mind and am basking in our honeymoon phase. 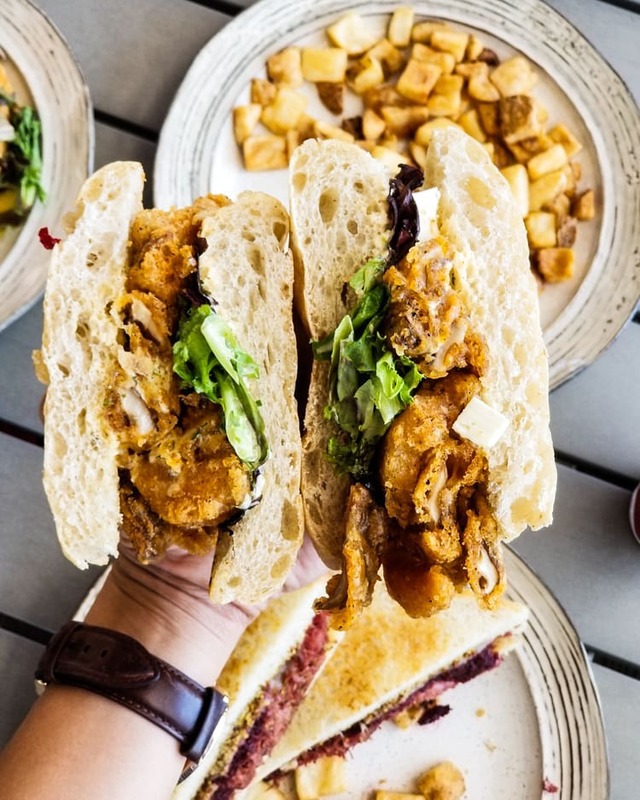 I have been exploring the world of sandwiches in the Research Triangle Area of North Carolina and am happy to share with you a list of winning sandwiches. chili sauce, crushed peanuts; $12Upon pulling up to Na’ Mean and seeing that it’s tucked inside a quiet strip mall, I’m already smiling to myself. You may remember how I feel about strip mall gems. 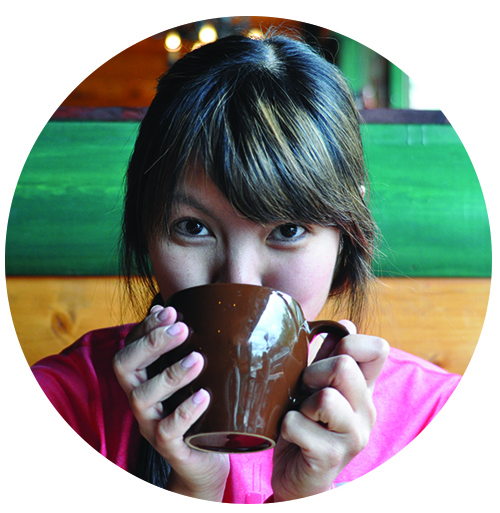 Just glancing at their creative menu made me happy. 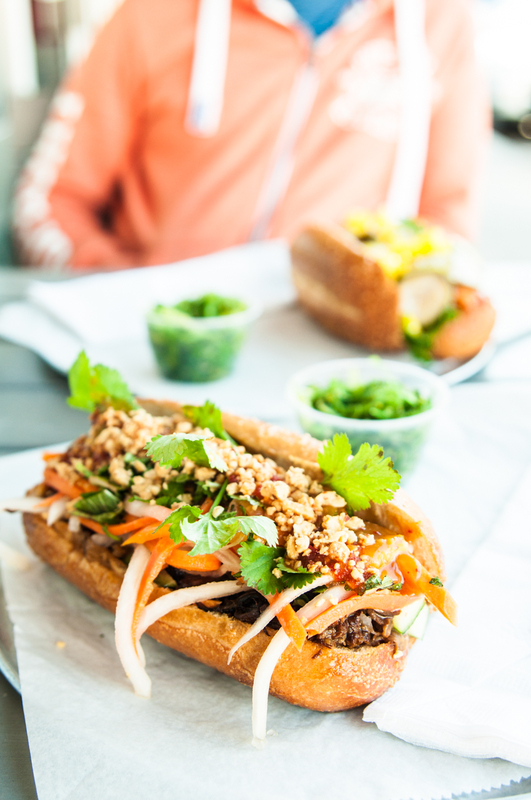 There were banh mi inspired sandwiches the first half of their menu, and noodle and salad bowls the second half. When I took my first bite of the “Baht Mi” sandwich, which has BBQ short rib, honey peanut sauce, chilies, cucumber, mint, pickled vegetables, and their housemade chili sauce, I was converted to a loyal fan. I am excited to work my way through the rest of the menu. Beasley’s Chicken + Honey was my first experience of an Ashley Christensen restaurant and though I admired her from afar, eating at Beasley’s endeared me to her work even more. I had been scouting the area for Nashville Style Hot CHicken and was almost certain that it doesn’t exist in the area when I got wind of Beasley’s Chicken + Honey having it on their menu. That spicy sandwich had me sweating in seconds, and yet, I’d go back for more. It hurt so dang good. I also tried their fried chicken sandwich, and what it lacked in spicy kick, it made up in uncomplicated pleasure. Mmm, that perfect crispy batter on the outside and the juicy chicken on the inside! One of my Austin friends, Patrick, would ask me if I made it to Raleigh Times anytime we caught up since I moved to the area. He kept mentioning their Reuben. I finally heeded his advice and tried their Reuben (blurred in the background of the photo above), and their shrimp po’boy. And I loved both their sandwiches so much that I’m certain I’ll only order these two sandwiches when I return. Maybe future dining companions will broaden my experience by ordering other things that I can steal bites of, but I’m smitten with these two sandwiches. The Reuben had kimchi collard greens. I’ve yet to have a Reuben with collard greens, much less kimchi collard greens. It worked pretty well! 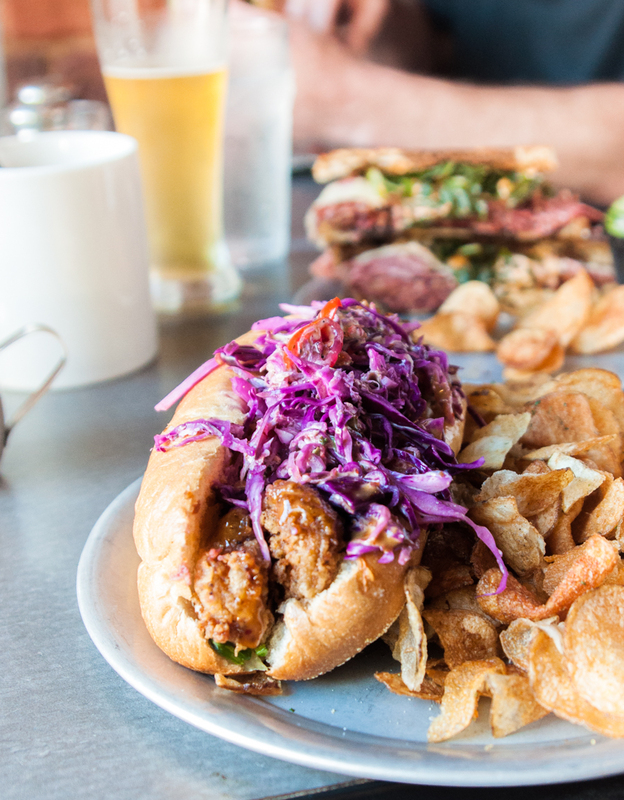 The shrimp po’boy was just as delightful with their Vietnamese purple slaw. I highly recommend both sandwiches! pepper, and bacon; $7.15 / Extra $1.31 for avocado (worth it! )I like when a restaurant or business does one thing so well, they can operate their business with just that one thing if they wanted to! Such is the case with Merritt’s Grill and their BLT. They have other things on their menu aside from the BLT but really, just get the BLT. 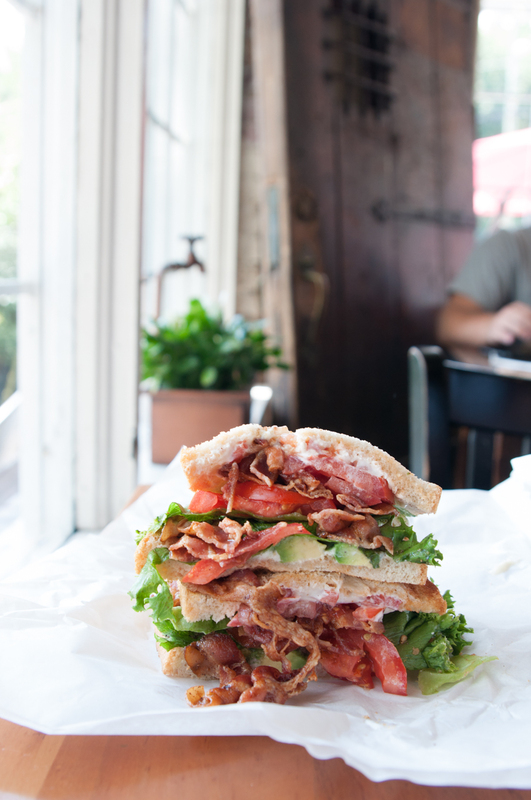 I add avocado to mine and have to refrain from humming happily as I eat this famed BLT sandwich. You can get amazingly fresh seafood at Saltbox Seafood Joint. 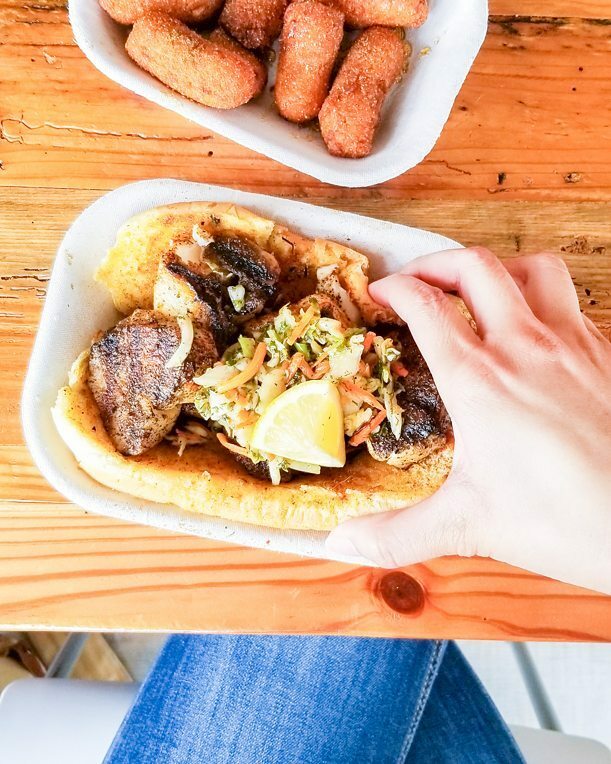 Their fish sandwiches are topped with their slaw will have you excited to come back and order another. Order yours with a side of their hush honeys! When in the South, you must partake in the chicken biscuit sandwich. 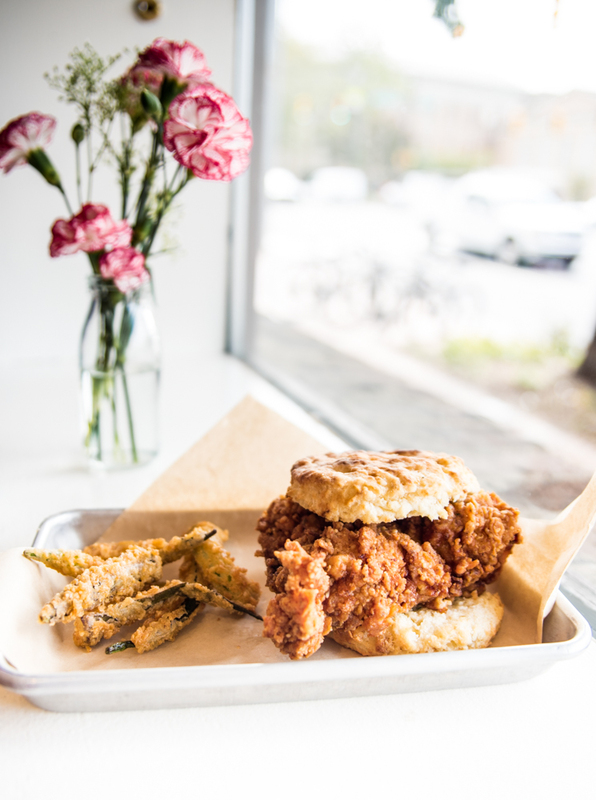 And if you’re in the Research Triangle Area, the place for chicken biscuit sandwiches is an unassuming drive-thru establishment opened only for breakfast and lunch, called Sunrise Biscuit Kitchen. I’ve learned this humble establishment has become somewhat of an institution for the chicken biscuit sandwich. I decided to order my chicken biscuit with added pimento cheese, to give it another layer of Southern charm, and because I’m a glutton, I ordered a hash brown and slipped it into my sandwich. 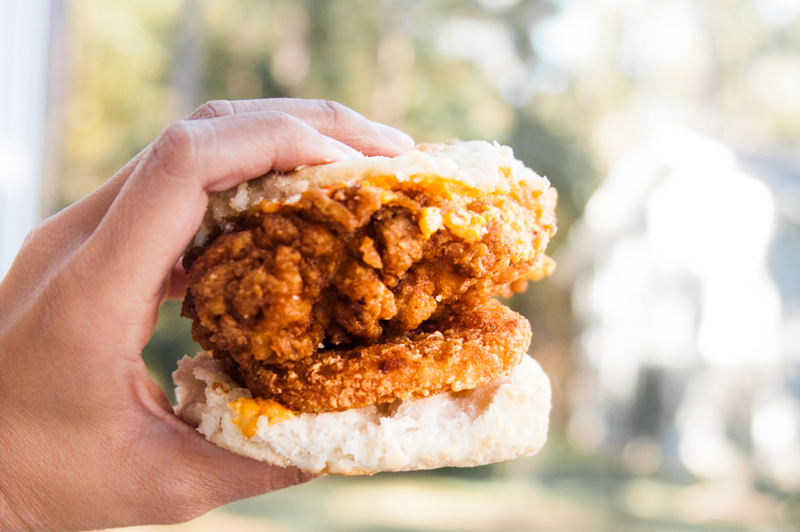 Um, if that’s too much for you to handle, just the chicken biscuit will probably make you happy too! Fried Chicken Thigh Biscuit SandwichMy favorite chicken biscuit sandwich in Chapel Hill is from Lula’s. They just opened on Franklin St. and have been quite impressive. Their Fried Chicken Thigh Biscuit Sandwich is my go-to order. The fried chicken thigh is drizzled with the same house-made spun sage honey they give out with their biscuits. The sandwich is bigger than my head and is so reasonably priced! Look out for their fried shrimp sandwich that they have occasionally on special! Beer-Battered Oyster Mushroom SandwichWho knew a vegetarian sandwich can look this enticing? Grub Durham makes a beautiful beer-battered mushroom sandwich with feta cheese and sriracha ranch! What a winning combination! I’ve also tried and liked their Reuben sandwiches! 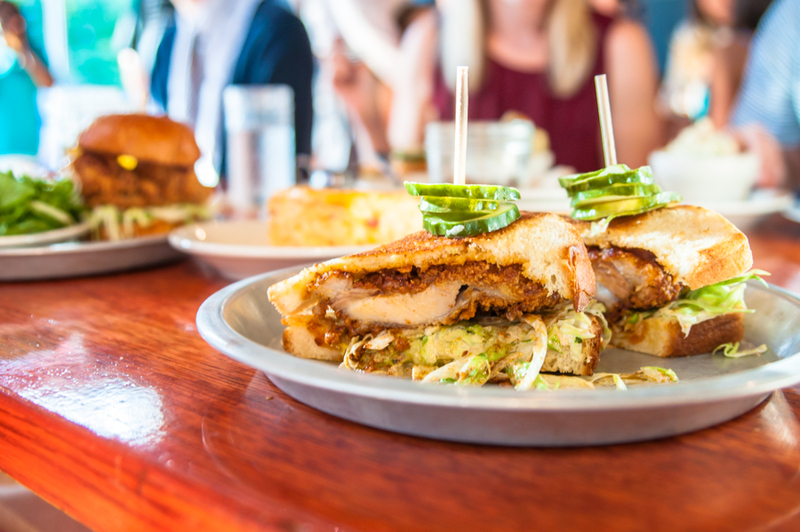 This adorable new sandwich shop in Durham is a popular and casual new addition to Durham. I went recently for the first time and loved everything about my order. 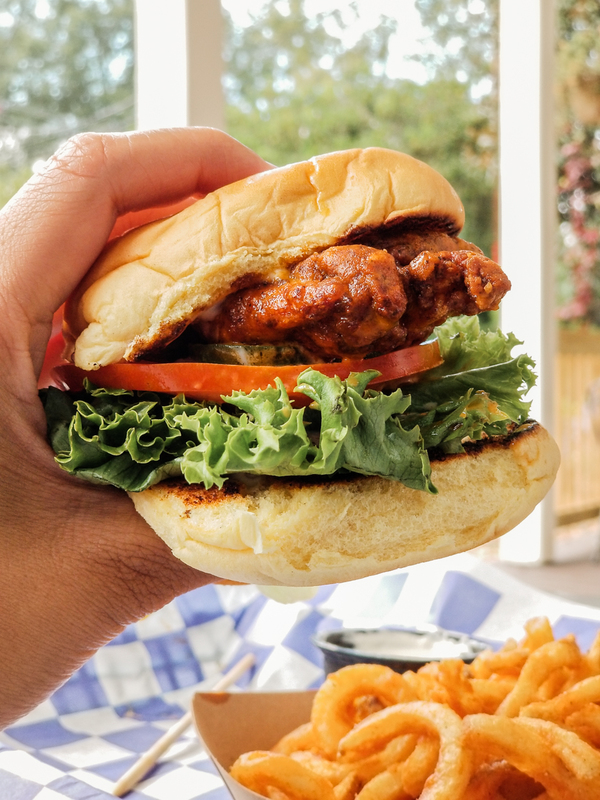 The buffalo chicken sandwich with curly fries. I didn’t realize how long it had been since I enjoyed curly fries! Simple pleasures, my friends, simple pleasures. Over to you now! Did I miss your favorite sandwich? If you’re not from the RDU area, please comment and tell me about your favorite sandwich.